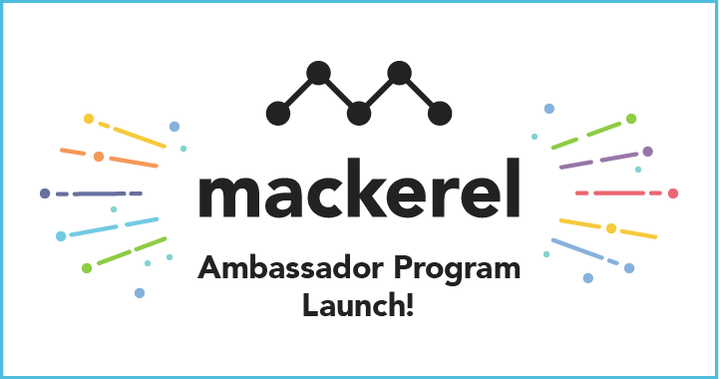 The other day, we released an entry announcing the Mackerel Ambassador Program. The eye-catching image used in that announcement was actually created by id:mazco who recently joined the Mackerel team as a designer. We wanted an image that captured a feeling of celebration for the start of the new program. id:mazco really delivered and made this bright and cute design that resembles a popping party cracker. We’re really looking forward to all the new Mackerel designs, not only with media-related designs like these, but also for the UI/UX, novelty gifts, and more. You can now obtain a list of email addresses invited to organizations, permissions granted, and invitation expiration dates via the API. As was announced in the entry below, communication via TLS1.1 has been stopped. For more details, check out the following link. Revisions were made Mackerel's Terms of Service on Tuesday, January 15th. Check out the entry below for details on the changes. The issue of Japanese character corruption during plugin execution for Windows was fixed with the release of mackerel-agent v0.59.0. Up until now, an inode check was always performed with the check-disk plugin even if only the -w / -c option was specified. Because of this, the plugin was not compatible in Windows environments where inodes do not exist. With the release of go-check-plugins v0.27.0, checking for inodes can be skipped when only the -w / -c option is specified. With this, the check-disk plugin is now also available in Windows environments. In addition to this, with the release of mackerel-agent v0.59.0, the check-disk plugin is now also included in the mackerel-agent installer for Windows. With the release of mackerel-agent-plugins v0.54.0, evicted_keys has been added to the metrics of mackerel-plugin-redis. With the release of mackerel-agent-plugins v0.54.0, multiple new metrics have been added to the metrics of mackerel-plugin-squid. With the release of mackerel-agent-plugins v0.54.0, it is now possible to connect with mackerel-plugin-postgres without a password. A big thanks to everyone who contributed pull requests!